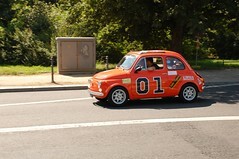 The General Lee…Berlin Style | Map This! I’m amazed that this photo (taken on a whim, and snapped really fast without composing) has become my most popular photo on Flickr. Flickr has added a nice statistical tracking package to their feature that lets you see how many views each of your photos has received, where that traffic has come from (other sites that link to the photo), etc.